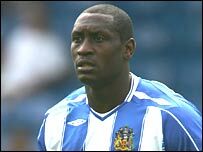 Wigan and England striker Emile Heskey has suffered a suspected broken metatarsal and has been sent to hospital for X-rays on his toe. Heskey was forced off after only nine minutes of the 1-1 draw with Fulham. The 29-year-old striker had been given a standing ovation by both sets of fans as he took to field in recognition of his superb recent England performances. But he may now be ruled out for three months - only days after ending three years in the international wilderness. This is a real blow for us - how does everyone think we will do without England's number 9? If the injury is confirmed to be a broken metatarsal, Heskey will miss England's next two Euro 2008 qualifiers, at home to Estonia and away to Russia, in October. England coach Steve McClaren will, however, have Wayne Rooney available again after the striker returned to Manchester United's squad on Saturday after recovering from his own metatarsal injury.